Tyron Lakent Woodley (born April 7, 1982) is an American professional mixed martial artist, rapper, broadcast analyst, and former UFC Welterweight Champion. A professional since 2009, Woodley also fought in Strikeforce. As of April 16, 2019[update], he is #13 in official UFC pound-for-pound rankings. Woodley was born and raised in Ferguson, Missouri. He was the eleventh of thirteen children born to Sylvester and Deborah Woodley. He was raised by his mother after his father left the family early in his life. In high school, he was a two-sport athlete, competing in American football and amateur wrestling. After graduating from McCluer High School in 2000, Woodley attended University of Missouri and joined their wrestling program. There, he became a two-time All-American; once in 2003 and again in 2005. Woodley graduated from the university in 2005 with a major in Agricultural Economics. Woodley fought his first professional fight on February 7, 2009, against Steve Schnider. It was held by Headhunter Productions at the Holiday Inn Select Executive Center in Columbia, Missouri. Woodley won via submission in the first round. Woodley's second professional bout was against Jeff Carstens on April 30, 2009. He won the bout via submission in the first round. Woodley made his Strikeforce debut against Sal Woods in St. Louis, Missouri. The fight was at the event Strikeforce: Lawler vs. Shields on June 6, 2009. Woodley won the fight by submission late in round one. After the win, Strikeforce signed Woodley to a six-fight deal. Woodley made his second appearance for Strikeforce on the Strikeforce Challengers: Kennedy vs. Cummings card. He defeated Zach Light via submission in the second round. On the Strikeforce Challengers: Woodley vs. Bears card, Woodley had his third fight for Strikeforce, defeating Rudy Bears via arm-triangle submission. Woodley's next bout was against Nathan Coy at Strikeforce Challengers: Lindland vs. Casey in Portland, Oregon. He won via split decision. On October 9, 2010, at Strikeforce: San Jose, Woodley defeated André Galvão via knockout midway in the first round. Woodley fought Tarec Saffiedine on January 7, 2011, in Nashville, Tennessee at Strikeforce Challengers: Woodley vs. Saffiedine. Woodley won the fight via unanimous decision. After the win, Woodley was signed to a contract extension with Strikeforce. At Strikeforce: Fedor vs. Henderson, Woodley replaced Evangelista Santos and fought Paul Daley. Woodley defeated Daley via unanimous decision. Woodley then fought Canadian prospect Jordan Mein at Strikeforce: Rockhold vs. Jardine. Woodley won via split decision. Woodley faced Nate Marquardt on July 14, 2012, at Strikeforce: Rockhold vs. Kennedy for the vacant Strikeforce Welterweight Championship. He lost the fight via KO in the fourth round. Woodley faced Jay Hieron on February 2, 2013, at UFC 156 in his promotional debut, replacing an injured Erick Silva. Woodley won the fight via KO at just 36 seconds of the opening round. Woodley faced Jake Shields on June 15, 2013, at UFC 161. Woodley lost the fight via split decision. Woodley next faced off against Josh Koscheck at UFC 167 on November 16, 2013. He won the fight via knockout in the first round. The win also earned him his first Knockout of the Night bonus award. Woodley next faced former Interim Welterweight Champion Carlos Condit at UFC 171. Woodley won via TKO after Condit suffered a knee injury in the second round. On April 8, 2014, Woodley's new eight-fight contract with the UFC was announced alongside his match against Rory MacDonald at UFC 174. He lost the fight via unanimous decision. Woodley next faced Dong Hyun Kim on August 23, 2014, at UFC Fight Night 48, replacing Hector Lombard. He won the fight via TKO early in the first round. The win also earned Woodley his first Performance of the Night bonus award. Woodley faced Kelvin Gastelum on January 31, 2015, at UFC 183 in a catchweight bout after Gastelum failed to make the welterweight limit. He won the fight via split decision. Woodley was expected to face Johny Hendricks on October 3, 2015, at UFC 192. It was announced on October 2, 2015, that Hendricks was forced out of the fight due to complications with weight cutting. Woodley faced welterweight champion Robbie Lawler on July 30, 2016, in the main event at UFC 201. He won the fight via knockout halfway through the first round to claim the UFC Welterweight Championship. This win earned him the Performance of the Night award. Woodley made his first title defense against Stephen Thompson on November 12, 2016, at UFC 205. The fight ended in a majority draw with two judges scoring the fight 47–47 and the third 48–47 in favor of Woodley. Subsequently, both fighters were awarded Fight of the Night bonus awards. The rematch with Thompson took place on March 4, 2017, in the main event at UFC 209. It was another closely contested bout with Woodley winning via majority decision. For his third title defense, Woodley faced Demian Maia on July 29, 2017, in the co-main event at UFC 214. He won the fight by unanimous decision. Woodley stated after the contest that he had torn his labrum in his right shoulder in the opening round. Woodley would later have reconstructive surgery to repair the damage. Woodley next defended the UFC Welterweight Championship against Darren Till on September 8, 2018, at UFC 228. He won the fight via submission in the second round. This win earned him the Performance of the Night award. Woodley also received his Brazilian Jiu-Jitsu black belt in the cage from Din Thomas following his victory. In the fifth defense of his Welterweight title, Woodley faced Kamaru Usman on March 2, 2019, in the co-main event at UFC 235. He lost the fight by unanimous decision, ending his nearly three-year reign as Welterweight champion. A rematch with Robbie Lawler is expected to take place on June 29, 2019 at UFC on ESPN 4. Woodley is married and has four children. He has said that his goal is to open a non-profit facility for troubled youths one day. When his hometown of Ferguson, Missouri engaged in civil unrest after the shooting of Michael Brown, Woodley publicly condemned the violent protests and lootings that took place. Woodley has pursued acting in his spare time and played roles in both Straight Outta Compton, Kickboxer: Vengeance and Sultan, the latter being an Indian movie directed by Ali Abbas Zafar. He also appears in several fight scenes of Escape Plan 2: Hades. Additionally, he hosts a podcast called "Morning Wood with Deez Nutz" and a weekly internet web show on TMZ called "The Hollywood Beatdown". Loss 19–4–1 Kamaru Usman Decision (unanimous) UFC 235 March 2, 2019 5 5:00 Las Vegas, Nevada, United States Lost the UFC Welterweight Championship. Win 19–3–1 Darren Till Submission (D'Arce choke) UFC 228 September 8, 2018 2 4:19 Dallas, Texas, United States Defended the UFC Welterweight Championship. Performance of the Night. Win 18–3–1 Demian Maia Decision (unanimous) UFC 214 July 29, 2017 5 5:00 Anaheim, California, United States Defended the UFC Welterweight Championship. Win 17–3–1 Stephen Thompson Decision (majority) UFC 209 March 4, 2017 5 5:00 Las Vegas, Nevada, United States Defended the UFC Welterweight Championship. Draw 16–3–1 Stephen Thompson Draw (majority) UFC 205 November 12, 2016 5 5:00 New York City, New York, United States Retained the UFC Welterweight Championship. Fight of the Night. Win 16–3 Robbie Lawler KO (punches) UFC 201 July 30, 2016 1 2:12 Atlanta, Georgia, United States Won the UFC Welterweight Championship. Performance of the Night. Win 15–3 Kelvin Gastelum Decision (split) UFC 183 January 31, 2015 3 5:00 Las Vegas, Nevada, United States Catchweight (180 lbs) bout; Gastelum missed weight. Win 14–3 Dong Hyun Kim TKO (punches) UFC Fight Night: Bisping vs. Le August 23, 2014 1 1:01 Macau, SAR, China Performance of the Night. Win 12–2 Josh Koscheck KO (punches) UFC 167 November 16, 2013 1 4:38 Las Vegas, Nevada, United States Knockout of the Night. Loss 10–1 Nate Marquardt KO (elbows and punches) Strikeforce: Rockhold vs. Kennedy July 14, 2012 4 1:39 Portland, Oregon, United States For the vacant Strikeforce Welterweight Championship. 2010 Bully Beatdown Himself Episode: "Hair Today, Gone Tomorrow"
2017 The Night Shift Travis Episode: "Do No Harm"
2019 Hawaii Five-0 Kalino (Gunman 1) Episode: "E'ao lu'au a kualima"
"Offer Young Taro Leaves to"
^ a b "Tyron Woodley". UFC.com. Retrieved August 9, 2014. ^ Larry Brown (September 8, 2018). "Tyron Woodley awarded black belt after beating Darren Till". Larry Brown Sports. ^ "Tyron Woodley Promoted To BJJ Black Belt By Din Thomas After Submitting Darren Till". BJJ Eastern Europe. September 9, 2018. ^ "UFC Fighter Rankings". Ufc.ca. Retrieved December 1, 2014. ^ "Rankings | UFC". www.ufc.com. Retrieved April 17, 2019. ^ "MUTIGERS.COM Tyron Woodley Bio - Official Athletic Site Official Athletic Site - Wrestling". Mutigers.com. Retrieved December 1, 2014. ^ "Sherdog Prospect Watch: Tyrone Woodley". Sherdog. Retrieved December 1, 2014. ^ "Tyrone Woodley - Facebook". Facebook.com. Retrieved December 1, 2014. ^ "HP - The Patriot Act". Sherdog. Retrieved December 1, 2014. ^ "RIE 2 - Brotherly Love Brawl". Sherdog. Retrieved December 1, 2014. ^ "Tyron Woodley talks history with Robbie Lawler, says UFC 201 matchup not official yet". mmafighting.com. May 6, 2016. ^ "Tyrone Woodley vs. Tarec Saffiedine Heads Strikeforce Challengers 13". MMAWeekly.com. December 6, 2010. ^ "Tyron Woodley Believes He's No. 1 Contender and on Nick Diaz's Mind". MMA Fighting. Retrieved December 1, 2014. ^ "Titanic Tyron Woodley Avoids Paul Daley Iceberg, No Boats Sink at Strikeforce". MMAWeekly.com. July 31, 2011. Retrieved July 31, 2011. ^ "Healy-Hirota, Mein-Stinson, High-Moore Added to Strikeforce 'Rockhold vs. Kennedy' Card". sherdog.com. May 30, 2012. ^ "Tyron Woodley replaces injured Erick Silva, faces Jay Hieron at UFC 156". mmajunkie.com. January 2, 2013. ^ Mookie Alexander (February 27, 2013). "Jake Shields vs. Tyron Woodley planned for June 15th event in Canada". bloodyelbow.com. Retrieved February 27, 2013. ^ "Jake Shields outgrinds Tyron Woodley for upset split". mmajunkie.com. Retrieved June 15, 2013. ^ Dave Reid (August 22, 2013). "Josh Koscheck Faces Tyron Woodley At UFC 167". mmainsider.net. Archived from the original on September 27, 2013. Retrieved August 22, 2013. ^ Staff. "UFC 167 bonuses: St-Pierre, Hendricks, Woodley, Cerrone win $50,000". MMAjunkie.com. Retrieved November 17, 2013. ^ "Carlos Condit vs. Tyrone Woodley set for UFC 171 in Dallas". MMAjunkie.com. Retrieved December 17, 2013. ^ Gene Mrosko. "Carlos Condit injury gives Tyron Woodley TKO win". MMAmania.com. Retrieved March 15, 2014. ^ Mindenhall, Chuck (April 8, 2014). "Tyron Woodley inks an eight-fight deal with UFC, faces Rory MacDonald at UFC 174". MMAfighting.com. Retrieved April 9, 2014. ^ Staff (June 24, 2014). "Tyrone Woodley in for Hector Lombard, meets Dong Hyun Kim at UFC Fight Night 48". mmajunkie.com. Retrieved June 24, 2014. ^ Staff (August 23, 2014). "Tyron Woodley blasts Dong Hyun Kim into oblivion in just 61 seconds". middleeasy.com. Retrieved August 23, 2014. ^ Staff (August 23, 2014). "UFC Fight Night 48 bonuses: No $50,000 'Fight of the Night' awards". mmajunkie.com. Retrieved August 23, 2014. ^ Staff (November 19, 2014). "Kelvin Gastelum vs. Tyrone Woodley set for co-main of UFC 183 in Las Vegas". mmajunkie.com. Retrieved November 19, 2014. ^ Doyle, Dave. "UFC 183 results: Tyron Woodley decisions Kelvin Gastelum; doesn't want his money". MMAFighting.com. Retrieved February 3, 2015. ^ Dave Doyle (August 5, 2015). "Johny Hendricks vs. Tyron Woodley set for UFC 192". mmafighting.com. Retrieved August 5, 2015. ^ "Johny Hendricks forced out of UFC 192 fight after being rushed to emergency room". MMA Fighting. Retrieved October 2, 2015. ^ Nick Baldwin (May 4, 2016). "Robbie Lawler vs. Tyron Woodley targeted for UFC 201". bloodyelbow.com. Retrieved May 4, 2016. ^ Steven Marrocco (July 31, 2016). "UFC 201 results: Tyron Woodley blasts Robbie Lawler to win welterweight title with KO". mmajunkie.com. Retrieved July 31, 2016. ^ a b "UFC 201 bonuses: New champ Tyron Woodley pockets an extra $50,000 for his KO of Lawler". MMAjunkie. July 31, 2016. Retrieved September 9, 2018. ^ Tristen Critchfield (September 17, 2016). "Tyron Woodley to defend welterweight crown vs. Stephen Thompson at UFC 205". sherdog.com. Retrieved September 17, 2016. ^ a b Mookie Alexader (November 13, 2016). "UFC 205 results: Tyron Woodley retains title with majority draw vs. Stephen Thompson". bloodyelbow.com. Retrieved November 14, 2016. ^ Damon Martin (November 13, 2016). "Dana White confirms Tyron Woodley will rematch Stephen 'Wonderboy' Thompson". foxsports.com. Retrieved November 14, 2016. ^ "Woodley retains title with majority decision win". ESPN.com. Retrieved March 5, 2017. ^ "MMADecisions.com". MMADecisions.com. Retrieved March 5, 2017. ^ Mike Bohn (June 28, 2017). "Tyron Woodley to defend title vs. Demian Maia at UFC 214". mmajunkie.com. Retrieved June 28, 2017. ^ "UFC 214 results: Tyron Woodley stymies Demian Maia to retain welterweight title". MMAjunkie. July 30, 2017. Retrieved July 31, 2017. ^ "Woodley demands apology from White or he's going to start 'leaking some sh*t'". MMA Fighting. Retrieved August 1, 2017. ^ "Tyron Woodley - Official UFC® Fighter Profile". www.ufc.co.nz. Retrieved July 31, 2017. ^ "Dana White Rips Tyron Woodley, Rebooks Georges St-Pierre vs. Michael Bisping". yahoo.com. Retrieved July 30, 2017. ^ Shaun Al-Shatti (July 24, 2018). "Tyron Woodley vs. Darren Till slated for UFC 228". mmafighting.com. Retrieved July 24, 2018. ^ a b "UFC 228 bonuses: Tyron Woodley, Jessica Andrade among $50,000 winners". MMAjunkie. September 9, 2018. Retrieved September 9, 2018. ^ "Tyron Woodley Celebrates UFC Victory With A Black Belt To The Face". jiujitsutimes. September 8, 2018. Retrieved September 10, 2018. ^ Tristen Critchfield (January 6, 2019). "Tyron Woodley, Kamaru Usman to clash for welterweight championship at UFC 235". sherdog.com. Retrieved January 7, 2019. ^ "UFC 235 results: Kamaru Usman blanks Tyron Woodley, takes belt in one-sided affair". MMA Junkie. March 3, 2019. Retrieved March 4, 2019. ^ Brett Okamoto (March 27, 2018). "Woodley-Lawler to highlight June 29 Fight Night". espn.com. Retrieved March 27, 2019. ^ "Mailbag: Woodley on right path". Yahoo Sports. Retrieved December 1, 2014. ^ USA TODAY (November 26, 2014). 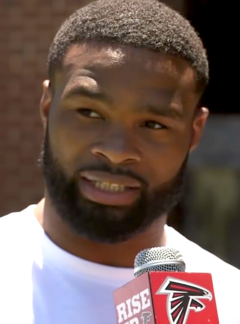 "UFC star Tyron Woodley 'outraged' by Ferguson violence" – via YouTube. ^ "Title Defenses – Fight Matrix". ^ "UFC Fight Night 48 bonuses: No $50,000 'Fight of the Night' awards". MMAjunkie. August 23, 2014. Retrieved September 9, 2018. ^ "ULTMMA". Ultmma.com. Retrieved December 1, 2014. ^ Sherdog.com. "Tyron". Sherdog. Retrieved September 14, 2018. ^ "Fight Life info". Archived from the original on July 30, 2012. ^ Suparno, Sarkar (December 5, 2015). "Salman Khan to fight against UFC fighter Tyron Woodley in Sultan [PHOTOS]". The Times Group. International Business Times. Retrieved December 17, 2015. This page was last edited on 17 April 2019, at 08:43 (UTC).